Azure supports Role-Based-Access-Control (RBAC) to controll what actions a principal (user, service principal etc) can perform via the Azure Portal, XPlat Cli or Azure PowerShell module. Azure provides quite a few built-in roles (48 at this time) but it is also possible to define your own custom roles. In this post I will provide a few general tips on RBAC and also how to go about creating your own custom roles. If a user is assigned a role that excludes an operation in NotActions, and is assigned a second role that grants access to the same operation, the user will be allowed to perform that operation. NotActions is not a deny rule – it is simply a convenient way to create a set of allowed operations when specific operations need to be excluded. You can view the list of custom roles (ones that you have created) available in the currently selected subscription by using the -Custom switch of the same cmdlet. When you are creating your own roles, you might want to see all the possible operations that can be permissioned for a particular resource type. In the example, below Microsoft.Sql/ represents Azure SQL Database and we use the Get-AzureRmProviderOperation cmdlet to search for all operations that begin with Microsoft.Sql/. There are two ways to create a custom role . If there is a built-in role close to what you need you can create a custom role based on an existing built-in (or indeed another custom role) and just modify the actions/notactions. $role = Get-AzureRmRoleDefinition "Virtual Machine Contributor"
$role.Name = "My Limited VM Operator"
$role.Description = "Can monitor, stop, deallocate and restart virtual machines." # If you wanted to grant the default permissions for this role and add new permissions, you could skip this step. A custom role defined in one subscription is not visible in other subscriptions. The role name must be unique to your Azure AD Tenant – e.g. if you want to use the same role definition across different subscription you will need to use a different name in each subscription – yes this is a pain and could cause some confusion. As you may have noticed from the code snippet above roles can be applied to multiple different scopes e.g. at the subscription level, resource group level or to an individual resource. It is important to remember that access that you grant at parent scopes is inherited at child scopes. The simplest way to modify an existing custom role is by retrieving the role definition via Get-AzureRmRoleDefinition and storing it in a variable, then adding/removing actions or changing the scope as required, and finally applying the changes with Set-AzureRmRoleDefinition. The only thing you’d need to change is the assignable scopes in order to make use of the role definitions. A custom limited subscription contributor role: this role was created to remove some types of sensitive operations from a subscription contributor. Of course what you deem as sensitive will change based on your context and the users involved. The custom role just adds sensitive operations into the NotActions. Ideally you should use more specific roles and scope the appropriately – but you may be asked to provide such broad access. One of the problems with this approach is new resource types are added frequently that may be sensitive so you have to constantly update the role definition. Plaster is a template-based file and project generator written in PowerShell. It is commonly used to create the scaffolding for the typical directories and files that are required to create a PowerShell module. However, it can also be used to create the scaffolding for a typical ARM template e.g. azuredeploy.json, azuredeploy.parameters.json, metadata.json files, Pester test script etc. You can find an example Plaster manifest for creating the scaffolding for an ARM template here in my Github repo https://github.com/vijayjt/PlasterTemplates/tree/master/AzureResourceManagerTemplate. This is a good start but in this post I will walk through some additional types of tests that you can run and also some gotchas I found with the example in the Azure Quickstart templates Github repo. There is a problem with this code in that the order in which the properties are returned through the line with the ConvertFrom-Json cmdlet may not match the order used by the expectedProperties variable. This issue can be solved by simply sorting the properties when you store them in the expectedProperties variable and also after the call to Get-Member. Next we need to deal with multiple parameter files when checking if parameter files have the expected properties. To do this at the top of the test script we create an array hashes of all the parameter files. Then we put the tests for parameter files in a separate context block and use TestCases parameter for a It block. We can extend the method used to check that a azuredeploy.json template file has the expected resources to also check that the resource has the expected properties. In the example below, we first check that a the azuredeploy.json contains a virtual network resource, then we check the virtual network has properties for address space, DHCP options and subnets. Another test we can add as part of our Pester testing script is to use the Test-AzureResourceGroupDeployment cmdlet to validate the template with each parameter file. This requires creating a resource group. $ShortGUID = ([system.guid]::newguid().guid).Substring(0,5) $TempValidationRG = "$ShortGUID-Pester-Validation-RG"
Here we use Pester-Validation-RG to easily identify what the purpose of the resource group is. We then prefix this with the first 5 characters from a GUID – to avoid clashes in the event you have multiple users or automated tests running at the same time in the same subscription. We can then use the BeforeAll block to create the resource group before running the tests and the AfterAll block to delete it after all tests have run. We then run Test-AzureResourceGroupDeployment with the template and each parameter file in turn uses the TestCases parameter for the It block. # Complete mode - will deploy everything in the template from scratch. If the resource group already contains things (or even items that are not in the template) they will be deleted first. $ValidationResult = Test-AzureRmResourceGroupDeployment -ResourceGroupName $TempValidationRG -Mode Complete -TemplateFile "$here\azuredeploy.json" -TemplateParameterFile "$here\$ParameterFile"
It obviously requires that we create a resource group – because although the Test-AzureResourceGroupDeployment cmdlet doesn’t actually create the resources in the template it requires a resource group in order to use it. While there is an AfterAll block block that deletes the temporary resource group that is created to validate the template, if you Ctrl-C the test script or there is some other problem e.g. such as a corrupted test group stack it may not clean up your temporary resource group. This will increase the time it takes for the tests to run because creating and deleting a resource group, even if it’s empty takes a little time. 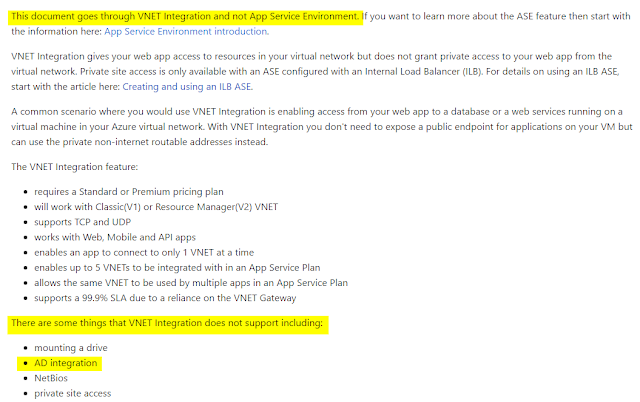 In a recent post I wrote about Azure App Service Environments (ASEs) and AD Integration. If you look at the Azure Quickstart template for a Web App in an ASE, you will notice that the location is passed in as a parameter instead of using the resourcegoup.location() function. This is because there is a known issue where the backend infrastructure for ASEs is not correctly handling the location string returned by this function call. This is mentioned in the following stackoverflow article http://stackoverflow.com/questions/42490728/azure-arm-cant-create-hostingenvironments-location-has-an-invalid-value. This caused some confusion as it appeared to suggest you could not communicate with domain controllers but it appears this is actually more in reference to domain joining. Furthermore, there is a Microsoft blog post on how to load a LDAP module for PHP with an Azure Web App – which indicates that it is a supported scenario. 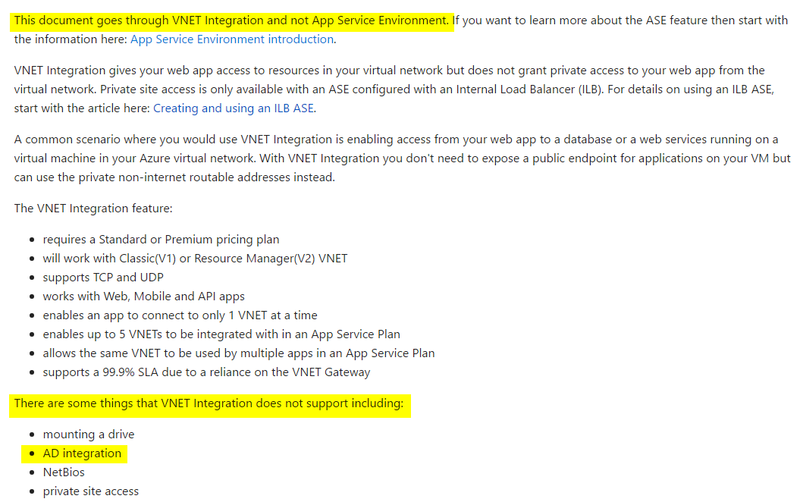 You can relatively easily verify this by deploying an Azure Web App with VNET integration or in ASE. I used a modified version of the template published here https://github.com/Azure/azure-quickstart-templates/tree/master/201-web-app-ase-create to create a Web App in an ASE. Then I used the PowerShell code in this Gist to install AD related roles and promoted the server to a Domain Controller via an answer file – change the forest/domain functional level and other settings to suit your needs. At this point you can perform a rudimentary test of AD integration via Kudu/SCM PowerShell console. If you wish to test using PHP, you will need to download the PHP binaries from http://windows.php.net/download/, and extracted them on my computer, in the ext directory you will find the php_ldap.dll file. Note the version you downloads needs to match the version of PHP you have configured your Web App with, which in my case was 5.6. Next from Kudu / SCM I created a directory named bin under /site/wwwroot, in that directory. Then using FTPS (I used FileZilla, but you will need to create a deployment account first) to upload the php_ldap.dll file.